Kahoʻolawe Aloha ʻĀina focuses on the cultural, political and military significance of the "target island" of Kaho‘olawe in the Hawaiian archipelago. The Hawaiian term aloha ‘āina refers to love of the land, the basis of Hawaiian cultural belief that animates the current movement to bring the island back to life. 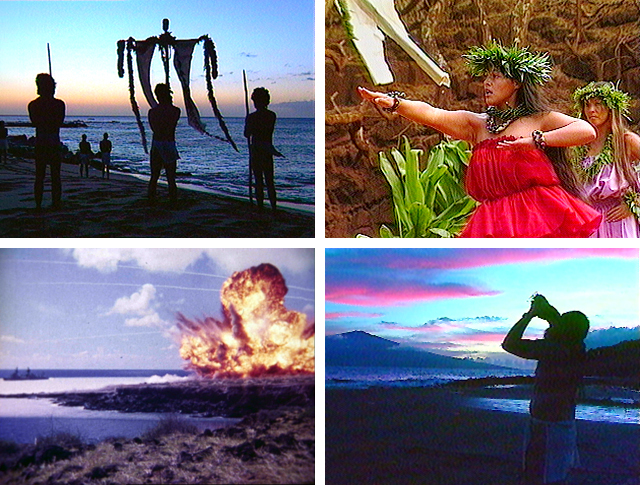 This video, produced by the Protect Kaho‘olawe ‘Ohana and directed by Nā Maka o ka ‘Āina, traces the history of the island, from ancient times through the years of ranching, U.S. military bombardment and the modern-day struggle to stop the bombing and reclaim the island. An ancient chant set against sweeping aerial views of the island opens the program as the viewer sets out on a tour of Kaho‘olawe's historic past. The island's summit was used in ancient times as an astronomical observatory and its southern point provided a prime launching site for canoe voyages to Tahiti. The program traces the later history of the island, from the degradation of the island's environment through the introduction of goats, sheep, cattle, to military bombing. The 1970's saw a turnaround in the history of Kaho‘olawe as Hawaiians began to occupy the island, protesting its desecration. Out of a commitment to stop the bombing was born the Protect Kaho‘olawe ‘Ohana (Family). Their visits to Kaho‘olawe for archeological surveys, water studies, re-planting and religious rituals are highlighted by the annual observance of Makahiki, a season of peace celebrated with dance, music and feasting. Finally the program takes a look at the debate over the future of Kaho‘olawe. An order by President George H. W. Bush to stop the bombing in 1990 was followed by congressional action to appropriate funds for the removal of ordnance and to return the island to the sovereign nation of Hawai’i, pending its recognition. Uncle Harry Kunihi Mitchell, Nalani Kanakaole, Noa Emmett Aluli, Davianna McGregor, Leslie Kuloloio, Steve Tachera, Kate Vandemoer, Palikapu Dedman, Ku Kahakalau, Kealohikina, Attwood Makanani, Kelii "Skippy" Ioane, Kala Mossman, Lopaka Williams, Malama Chun, Craig Neff, Rodney Morales, Coochie Cayan, Moke Kim, Shannon Lima, Dan Holmes, Capt. Walter Tobias, USN, Rear Admiral William Earner, USN, Capt. Mittendorf, Col.Wallace Campbell, USMC. Narrated by John Dominis Holt and Ekela Kaniaupio.